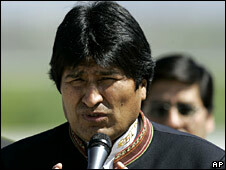 The US is to expel Bolivia’s envoy in Washington, one day after the US ambassador was told to leave Bolivia. 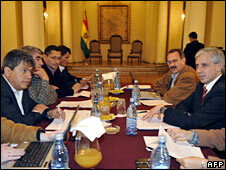 Bolivian ambassador Gustavo Guzman was declared “persona non grata”, the US state department said. On Wednesday Bolivian President Evo Morales blamed US envoy Philip Goldberg for “conspiring against democracy” and encouraging the break-up of Bolivia. Elsewhere, at least eight people have been killed in clashes between pro- and anti-government groups, reports say. The fighting between rival supporters took place in the northern Pando province. Some 20 people were reported injured. 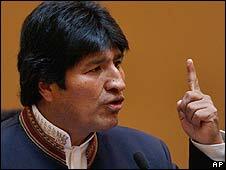 Bolivia has seen large protests in recent weeks by opponents of President Morales’s economic and social policies. Reacting to the decision to expel Mr Goldberg, whom Mr Morales accused of inciting protesters, a US state department spokesman said it was a “grave error” and described the accusations as “baseless”. The eight deaths in Pando happened as pro- and anti-government protesters fought each other with clubs, machetes and firearms, officials say. Protesters have also been blocking roads and occupying buildings in eastern regions, which are home to Bolivia’s important natural gas reserves. Opposition groups want greater autonomy as well as more control over revenues of natural gas in their areas. They object to Mr Morales’s plans to give more power to the country’s indigenous and poor communities, by carrying out land reform and redistributing gas revenues. On Monday, the government announced it was sending the military to protect gas fields and infrastructure from demonstrators and guarantee exports to neighbouring countries. On Wednesday, officials said saboteurs had caused a blast on a pipeline, forcing them to cut natural gas exports to neighboring Brazil by 10%. The Brazilian foreign ministry said in a statement that the government was taking the necessary measures to guarantee gas supplies in the country. 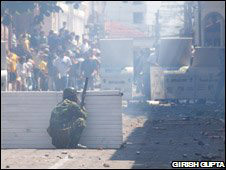 The statement also expressed Brazil’s “grave concern” at the events in Bolivia, and deplored the outbreak of violence and attacks on state institutions and public order.